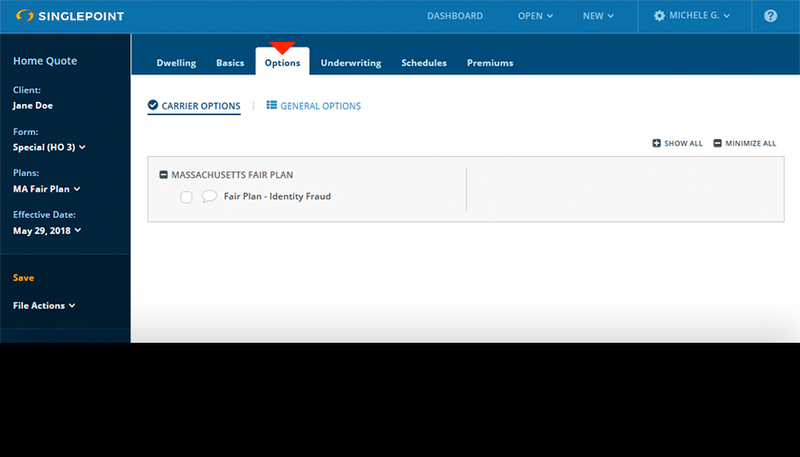 To begin, click the LOGIN button at the top of this page and log in to SinglePoint with your User ID and password. 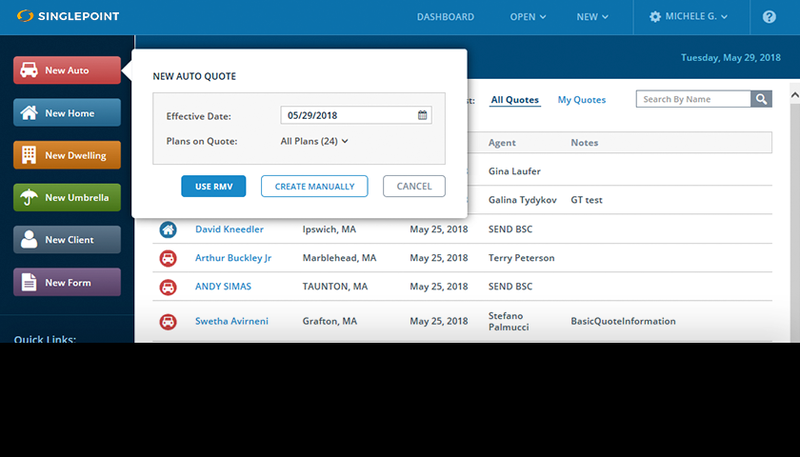 If you are unsure of your password, ask your SinglePoint Account Manager to reset it or call Boston Software. 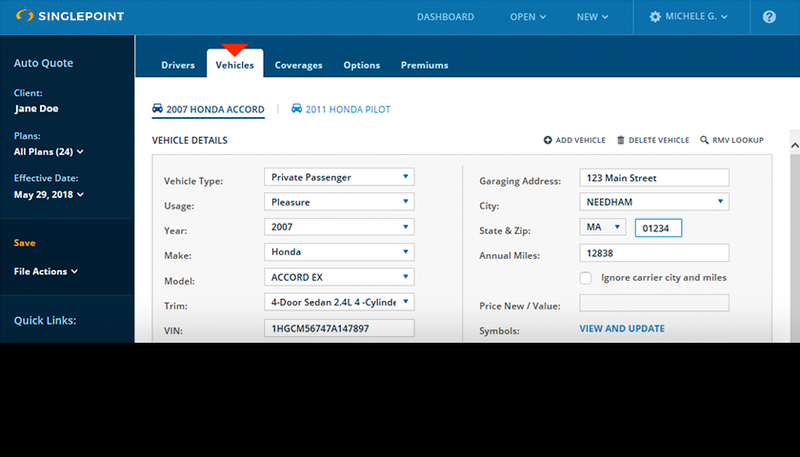 From the dashboard you can start a new auto quote or open an existing quote. 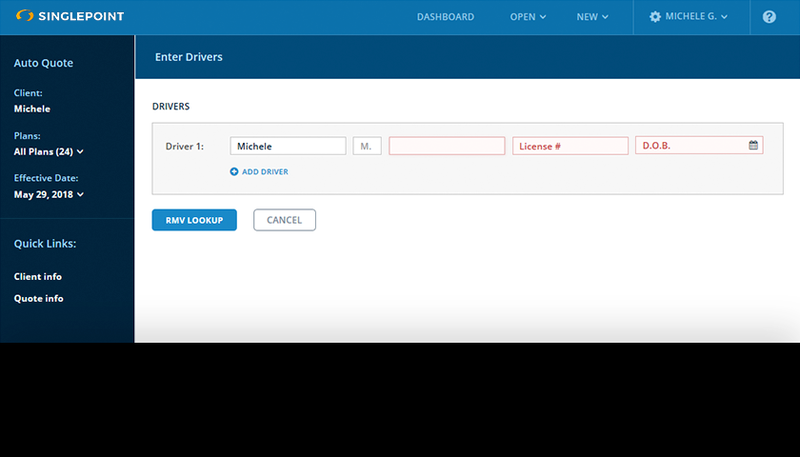 Enter the Operator’s Name, License # and DOB and select RMV Lookup. 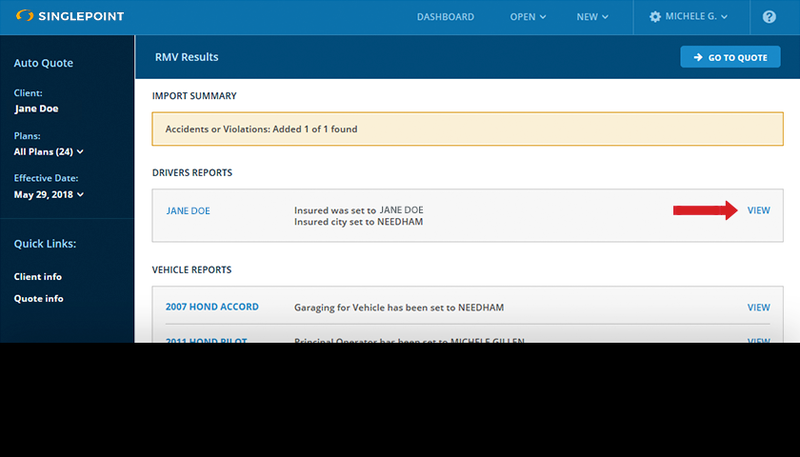 On the RMV results page, select View to open the Driver or Vehicle Reports, then Go to Quote. 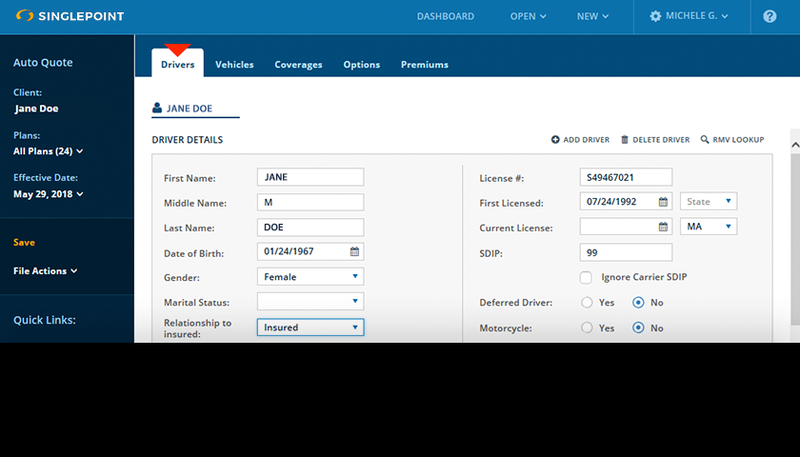 The Driver and Vehicle tabs are prepopulated from the RMV lookup. 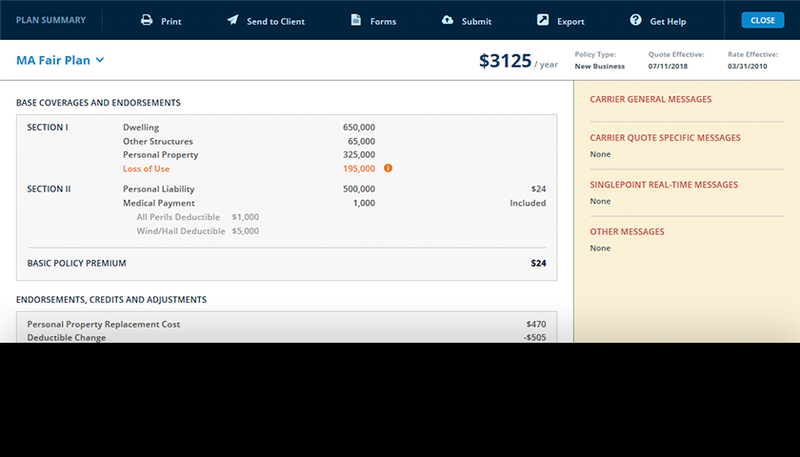 Be sure to review all data and complete any required fields. 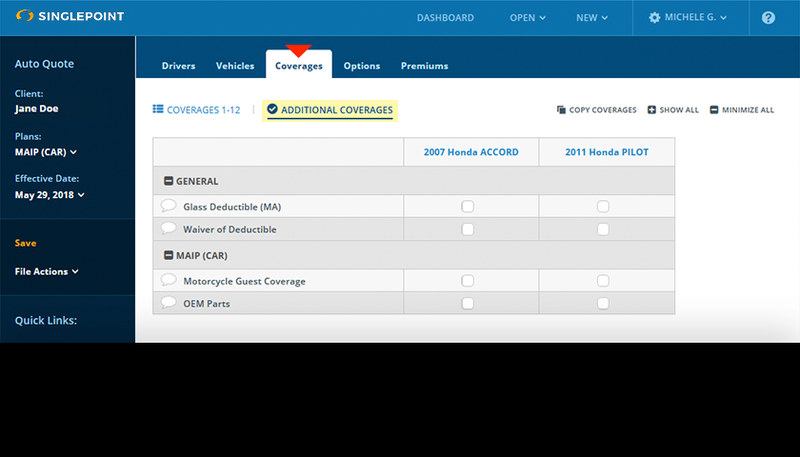 Be sure to navigate through each tab at the top of the screen to enter all necessary rating information. Any fields in red are required. 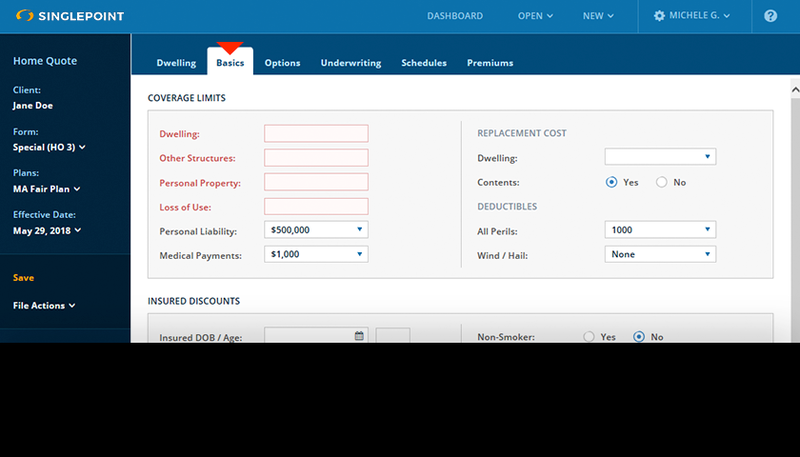 Coverages will default to those set by your agency, or you can customize them. 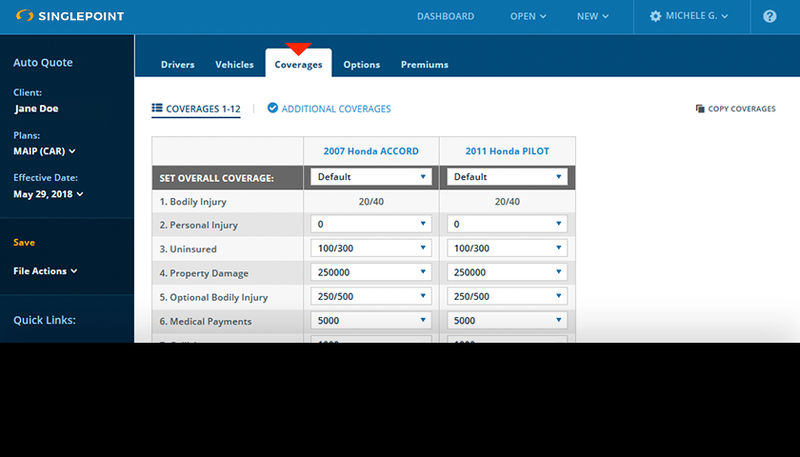 Open Additional Coverages to choose vehicle-level coverages such as Waiver of Deductible. 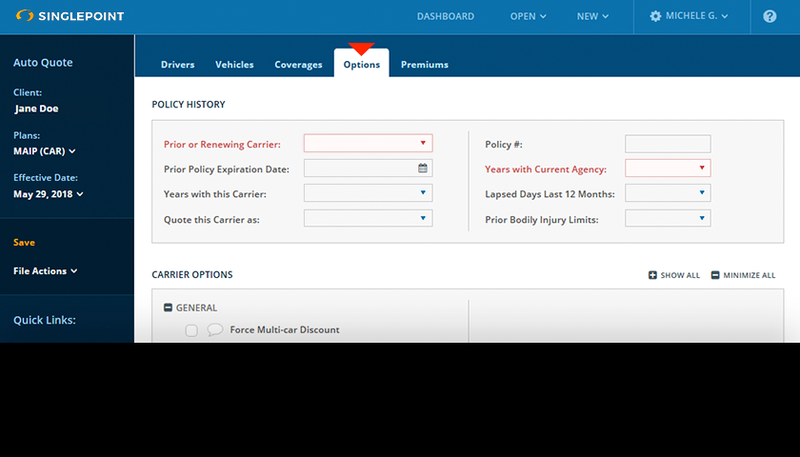 Enter Policy History and select Carrier Options as needed. 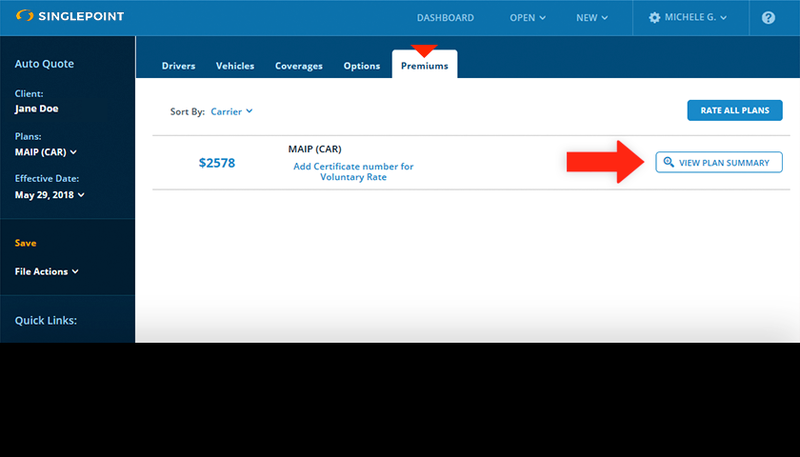 Rating occurs in the Premiums tab. Each carrier is ready to rate when there are no warnings below. Review buttons indicate missing information. 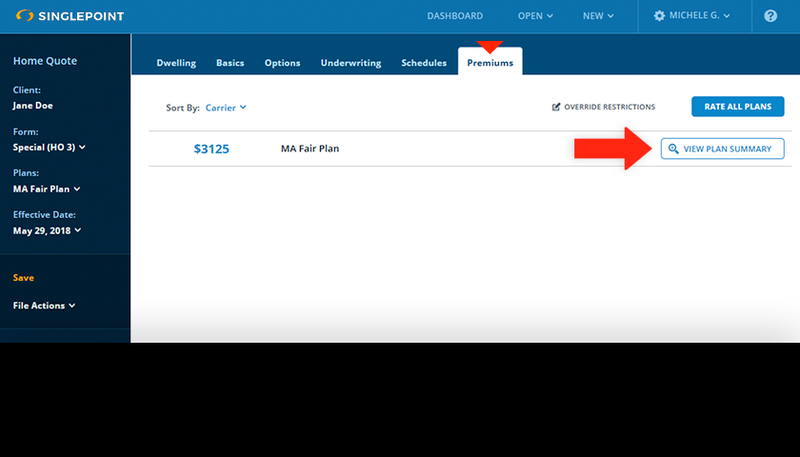 Click the magnifying glass to view plan summary. All actions buttons are found at the top of the Plan Summary. 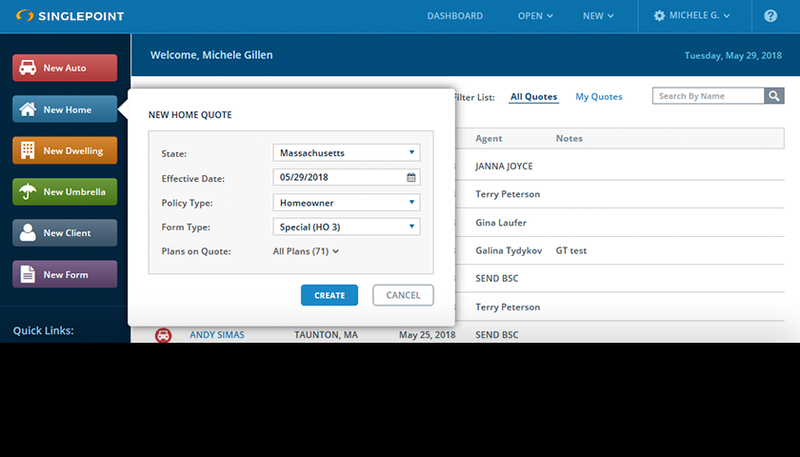 You can print, send, submit to carrier, export to your management system, get help from Boston Software, and do forms from this screen. 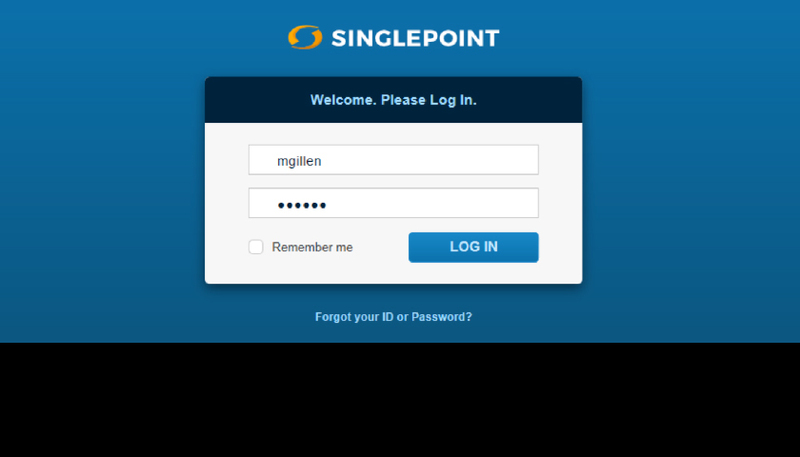 To begin, click the LOGIN button at the top of the page and log in to SinglePoint with your User ID and password. If you are unsure of your password, ask your SinglePoint Account Manager to reset it or call Boston Software. 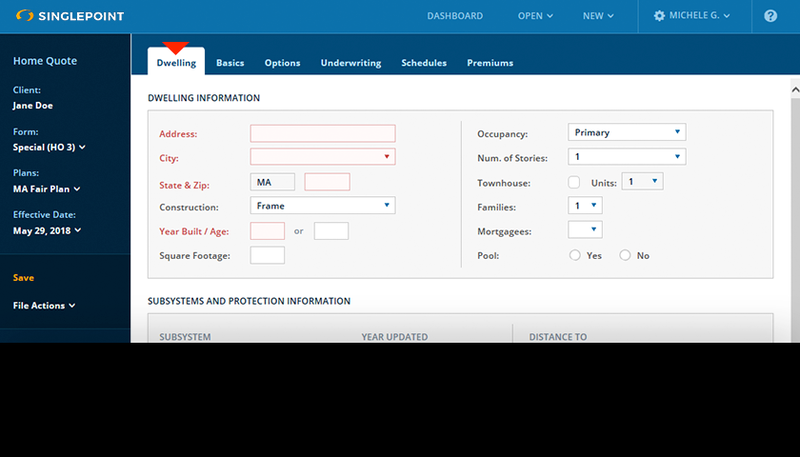 From the dashboard you can start a new home quote or open an existing quote. Enter the risk information on the dwelling tab. Be sure to scroll down to view the entire screen. Any fields marked in red are required and must be completed for rating. 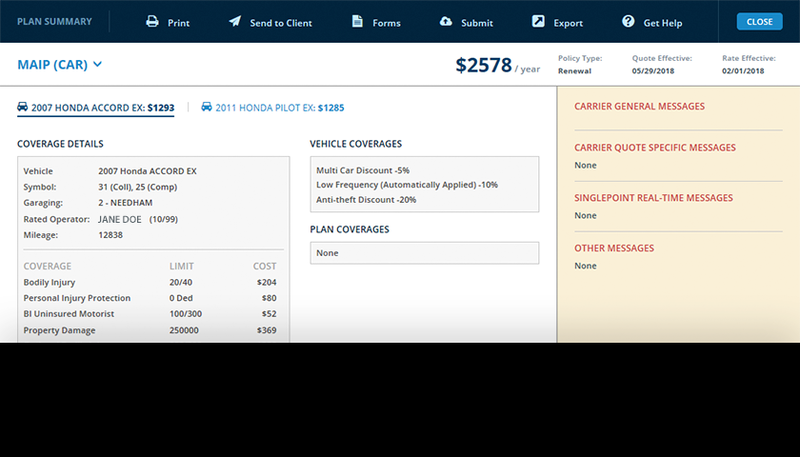 Select the desired Carrier Options. Be sure to open General Options to access those endorsements. 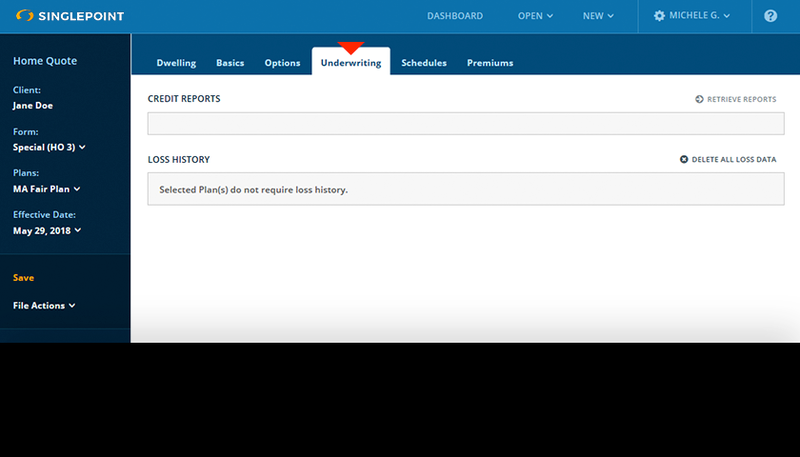 Credit Lookup and Loss Information are available on the Underwriting tab. 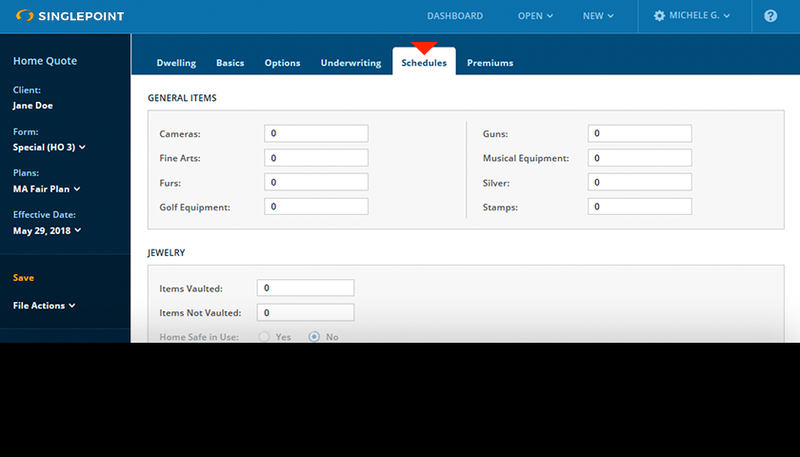 Scheduled items can be entered on this tab. If Agreed Value is available, it will appear here as well.